You know that if you are not in harmony with your vision, you will not be able to live a life that even remotely resembles it – with your health, in your business, or in your relationships. So why aren’t you in harmony with your vision? What’s in your way? How do you know when you’re not in harmony with your vision? You can’t get there, you “relapse” or sabotage a lot, you find excuses to explain why you’re not there yet, it’s taking too long, or you have lost interest. All of these are signs that you are no longer (or never were) in harmony with your vision. Time to get to work! #2) Identify how afraid you are to be in harmony with your vision. Ask yourself, what are you afraid of if you start living your vision? This is just another way to get to the underlying emotional conflict. 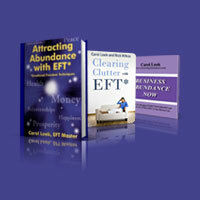 #3 ) Use simple EFT sequences to release the conflicts. #4) Recommit to your original vision, or take the time to redesign a new one! I know the unending frustration when it feels as if half of you is going one direction, and the other half of you is going in another direction! There is an easy way to stop wasting all that energy… identify the conflict, measure the fear, use EFT. Following these steps will help you Harmonize with Your Vision and move forward in your life immediately. When you are willing to Harmonize with your Vision, the universe will “hear” that you are committed to this vision you have constructed. The universe will help you by delivering opportunities that get you lined up with the vision you intend to live. When you are ready to Harmonize with Your Vision, you will release the resistance in your energy field, and then more channels of abundance will open up to you. Below you will find EFT/Tapping setup phrases to help you be inspired to Harmonize with Your Vision. Even though I have conflicts with my current vision, I deeply and completely love and accept myself anyway. Even though I’m afraid to harmonize with this vision for my life, I deeply and completely love and accept how I feel. Even though I can’t get clear on the best vision for my life, I deeply and completely love and accept all of me now. I have indicated where to tap while repeating the phrases below. You may repeat the positive phrases more than once if you wish. Eyebrow: I have conflicts with my vision. Side of Eye: I can’t get clear about my vision. Under Eye: I feel fear about living this vision I constructed. Nose: I am surprised about how many conflicts I have. Chin: I’m afraid to be too successful. Collarbone: I’m afraid of changing. Under Arm: I’m frustrated I haven’t been able to get there. Head: I still can’t get clear on my vision. Eyebrow: What if I could harmonize with my vision? Side of Eye: I want to get clear on my vision. Nose: I feel more ready than ever. Chin: What if I could really harmonzie with my vision? Collarbone: I want it to be the right vision for my life. Under Arm: I am looking forward to getting really clear. Head: I am grateful I am getting more clear about my vision. Thank you, Universe, for reminding me to Harmonize with My Vision… I feel more aligned with abundance already! Thank you, Universe, for inspiring me to Harmonize with My Vision… I am looking forward to uplifting results! Thank you, Universe, for making it so easy for me to Harmonize with My Vision… I feel the vibrational shift and power already! Enjoy these tapping sequences for Harmonizing with your vision, and I hope to see you at one of my upcoming workshops!